As the retail sector enters the run-up to Christmas, Retail Week, in association with PwC, unveils 12 trading predictions, including how much consumers plan to spend, what channels they will favour and which products they will splash out on at the expense of others. Retailers will welcome the news that absolute pay growth in the UK is at a higher level than at any point since the beginning of the global financial crisis and is growing faster than inflation. Unemployment also remains low, which is a key driver of consumer confidence, particularly when considering major purchases. PwC’s consumer sentiment survey, a predictor of future consumer spending, found that overall marginally more people thought they would be better off in the coming year than worse off. That’s an improvement on earlier in the year, and better than at any point during the recession up until 2014. Young people are the most optimistic, while only the over 55s and socioeconomic group E (benefit dependent, state pensioners) believe they will be worse off. 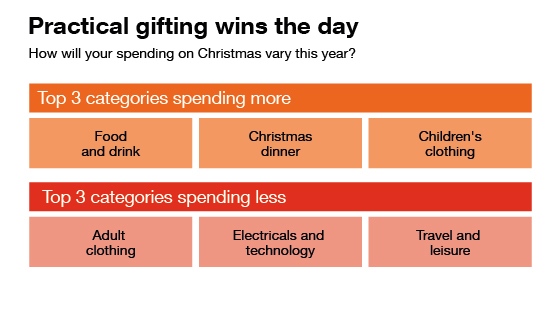 The average UK consumer plans to spend around £420 on Christmas presents. Given that average discretionary income in the UK is around £200 per household, according to Asda’s monthly income tracker, this means a typical household will need to save for more than a month to pay for Christmas presents. The highest spending 35- to 44-year-old age group plan to shell out almost 25% more than average, suggesting the importance of presents to families. The most generous present buyers will be north of the border, with Scots spending an average of £454 each. 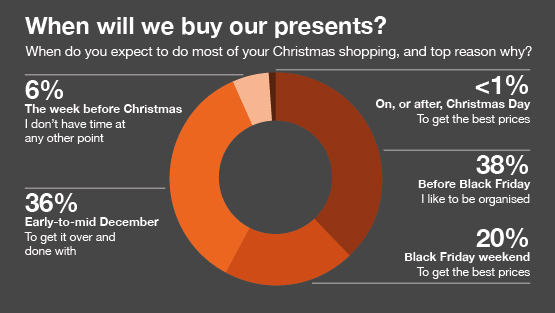 Meanwhile, 8% of us don’t intend to buy any presents at all. 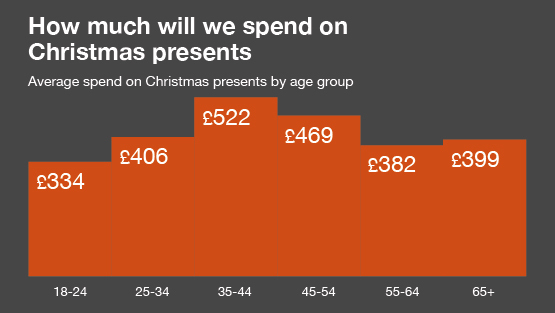 These are typically older people, with 12% of over 65s not planning to do any Christmas shopping. One in five UK consumers surveyed plan to start their Christmas shopping earlier this year – with the under 35s accounting for 30% of this group. The reality is likely to have been different, however, with the mild early autumn certainly delaying fashion spending. PwC expects the peak Christmas period to be early-to-mid December, although a brave 6% (the vast majority of these being men) intend to shop the week before Christmas. With Christmas Day falling on a Tuesday, and the journey home for many expecting to start the previous Friday, the sector could see a bumper shopping weekend and perhaps an increase in high street footfall between December 22nd and 23rd. Black Friday is a firm fixture in the annual retail calendar. In 2018, retailers planned for it better with more than three quarters running promotions to take advantage of the increased footfall and web traffic. While some observers criticise Black Friday for being margin dilutive and cannibalising sales, retailers have adjusted their promotional schedule and many would have discounted anyway. Fashion retailers with blanket storewide promotions, for example, would have had to reduce prices in the run up to Christmas in order to clear excess stock. From the consumer perspective, Black Friday has become the key period for buying “things for myself and my family” rather than Christmas presents, with electricals, fashion, beauty and toys right at the top of the shopping list. A trend towards ‘practical gifting’, identified in 2017, means consumers plan to spend more on food and drink followed by children’s clothing, making it the top category for 35- to 44-year-olds. As shoppers expected to splash out on electricals and fashion over Black Friday, these categories are cited as the lowest priorities for Christmas spending and beauty was not far behind. The one exception to this trend is among the under 25s. For this age group, the rankings were reversed, with fashion and technology being the top categories for increased spend. 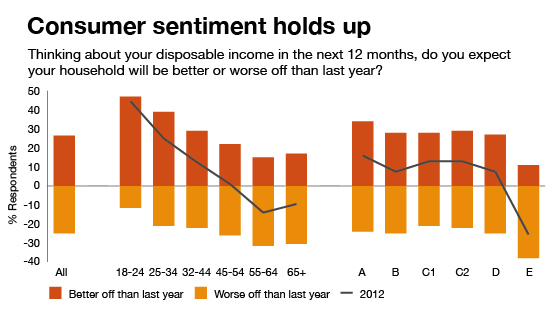 While they are not the biggest Christmas present shoppers (£334, or about 20% less than average), they have the highest sentiment and the greatest optimism for their disposable income going forward. There’s debate about whether the ‘lipstick effect’, first coined by Estée Lauder in 2001, exists and if sales of smaller luxury items do increase in economic downturns. Amid the turmoil of store closures on the high street, research finds buoyancy among ice cream parlours, booksellers, stationers and beauty salons. However, retailers are not leaving it to chance. Beauty was one of the most heavily promoted categories this Black Friday and one discount supermarket is even stocking a beauty Advent Calendar with 24 mini treats for £49.99. Spending on children continues to be a priority, not just for 35- to 44-year-old parents but also grandparents, with toys and children’s clothing among the top spending priorities for 55- to 64-year-olds and over 65-year-olds respectively. Meanwhile, two thirds of dog owners plan to buy their pets Christmas gifts this year, with each dog expecting to receive almost £20 worth of treats – or a total of £166m countrywide, according to an American Express survey. Sustainability has emerged as the key consumer trend of 2018 and this Christmas is no exception. The scale of consumer interest in the topic – ignited by the BBC’s Blue Planet TV programme – has taken some in the industry by surprise. Retail and consumer businesses are now hurrying to replace single-use and non-recyclable plastics with more sustainable alternatives. One of the most talked about Christmas advertising campaigns has been around the impact of palm oil on rainforests. And other single-issue campaigns are likely to emerge in the coming months for which retailers need to prepare. Meanwhile, grocers and fashion retailers are increasingly catering for vegetarians and vegans. Tesco predicts that there will be a vegetarian or vegan guest at one in five homes for Christmas dinner. And in Brighton, as many as 12% of Christmas dinners are forecast to be 100% plant-based. So what does this mean for retailers? First, companies on the front foot of sustainability have experienced improvements in consumer awareness and favourability towards their brand. Second, retailers should note changes in what consumers are buying. There is greater interest in second-hand and vintage clothing, particularly among younger shoppers, with the growth of apps such as Depop. Customers are also paying more attention to traditional gifting that gives a nod to the circular economy such as collectable toys that can be swapped and traded in the playground. Christmas shopping in 2018 is likely to be multichannel with consumers using every channel available to them. This even extends to home assistants and social media. While only 4% of total consumers click through from Instagram or Facebook to buy presents, that number increases to 14% of 18- to 24-year-olds. Online retailers and their logistics providers are using technology to improve delivery propositions with timed delivery slots, real-time tracking and the ability for customers to change dates and times. Click-and-collect deliveries are growing at twice the rate of normal deliveries, and the click-and-collect options available to consumers are growing even faster. So not just deliveries to retailers’ own stores, but also to secure lockers, manned collection points such as CollectPlus and Hermes ParcelShop, and even to competitor retailers such as Asda toyou. As the popularity of click and collect grows, some high street retailers are even encouraging store-based click and collect, either by offering free or cheaper in-store collection to drive add-on sales, or by hosting third-party collections to drive new customer footfall. 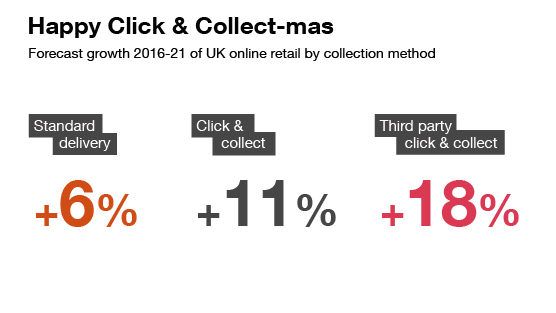 Right now, click and collect still only accounts for a sixth of the overall online delivery market. But will its increased popularity be enough to reverse the decline in high street footfall? While for a time in 2016 there seemed to be stabilisation in high street and retail park footfall, 2018 has been almost consistently bad news for high streets up and down the UK, with low single-digit footfall decline almost all year. Conveniently located retail parks often anchored by supermarkets and destination day-out shopping malls are likely to buck the trend. Westfield revealed a 7% increase in visitors over Black Friday weekend this year. However, with overall retail sales broadly flat and online taking share, the reality is that the British consumer has less need to visit physical stores than ever before. The effects of this footfall decline won’t be seen this Christmas, but more likely early in 2019 with Q1 traditionally the most common time for retail failures and associated store closures. High street leisure such as takeaways, restaurants and pubs are challenged by the same footfall decline and cost headwinds facing retailers, but also the rapid rollout of casual dining chains that has led to overcapacity on many UK high streets. The final challenge for restaurants is the growth in popularity of home delivery. A recent survey found that 20% of millennials were eating out less, shifting an estimated £1bn of out-of-home spending into home delivery. While more restaurants offer home delivery from the same high street kitchens, the reduced footfall and change in operating economics is causing a headache for all operators. With as many high-profile restaurant CVAs as retail ones earlier this year, and one pub a day closing on the UK’s Top 500 high streets, according to PwC’s store openings and closures research, there may be more pain to come for the leisure sector in 2019. 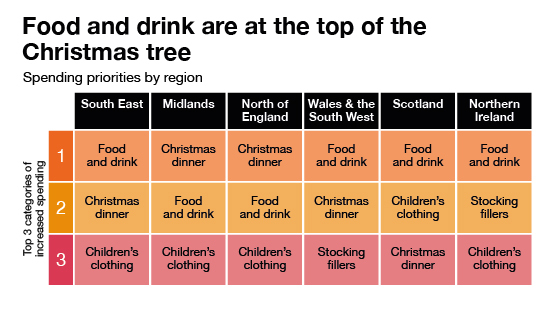 Christmas dinner remains the UK’s number one spending priority, topping the list of categories that consumers plan to spend more on this year, no matter which part of the country and no matter what age group. As with last year, consumers have consistently said during 2018 that they expect to spend more on groceries at the same time as cutting back on every other area. But, different to last year, with grocery price inflation having eased, shoppers don’t have to spend more to buy the same things. Grocers, particularly at the discount end, have responded by introducing even more premium ranges and edible treats. So, while the overall prognosis is for grocers to be celebrating come the new year, that doesn’t mean that there won’t be winners and losers. As with every sector of retail, it’s still all to play for as the year comes to a close. PwC will hold retail briefings on the 2018 Christmas trading results and outlook for the year ahead in January 2019. The events take place around the UK and more details can be found here. For further crucial insights on how consumers intend to shop over the Christmas period, download our report The Christmas Consumer 2018. Download The Christmas Consumer 2018 today.